Woodside Plaza is the 7th most walkable neighborhood in Redwood City with 5,768 residents. Woodside Plaza is somewhat bikeable. Nearby neighborhoods: Palm Park, Roosevelt, Redwood Oaks, Farm Hill, Oak Knoll-Edgewood Park, Staumbaugh-Heller and Centennial. Some errands can be accomplished on foot in Woodside Plaza Redwood City. Woodside Plaza is the 7th most walkable neighborhood in Redwood City with a Walk Score of 63. Find apartments in Redwood City's most walkable neighborhoods: Staumbaugh-Heller, Centennial and Redwood Village. 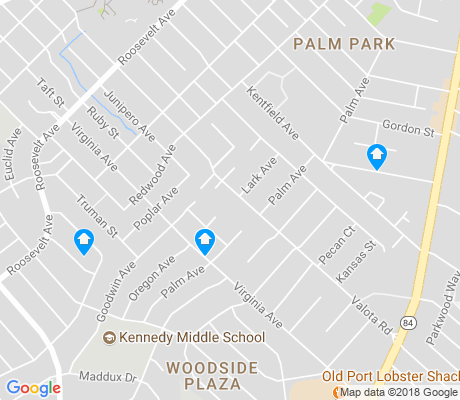 View all Woodside Plaza apartments on a map. Compare Woodside Plaza to other Redwood City neighborhoods. There are about 18 restaurants, bars and coffee shops in Woodside Plaza. People in Woodside Plaza can walk to an average of 1.0 restaurants, bars and coffee shops in 5 minutes.